Come on a journey through the America's most impressive natural landmark, the Grand Canyon as viewers follow river advocate Robert F. Kennedy, his eldest daughter Kathleen "Kick" Kennedy, adventurer anthropologist Wade Davis and his daughter Tara. Guided by Shana Watahomigie, a member of the Havasupair tribe, they explore one of America's most important waterways and how the changing climate of the world has truly devastated this natural wonder. Shot with stunning 3D IMAX photography, viewers can experience an almost surreal experience as they join this group as they perform white water rafting, learn the history of the river and inform the viewer on how mankind can change its devastating ways. 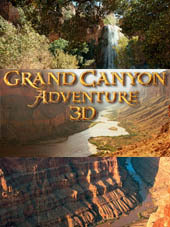 Grand Canyon Adventure is truly a spectacular presentation thanks to the high quality IMAX footage and as everything is in 3D, at times, it is almost like you part of this wondrous journey. However in certain parts of thiis documentary, it feels like a family vacation caught on IMAX as Kennedy wished to take his daughter on one last adventure before she starts college. This mixture of seriousness and a family journey seems a little strange, however if you can put this aside, the Grand Canyon Adventure - River at Risk is still an engaging documentary. It also opened my eyes that Australia is not the only continent danger of drought which is now a worldwide phenomenon. The premise behind this documentary, according to Kennedy is to raise the awareness of the nation and the world to save their valuable waterways and to conserve water. Amazingly enough, the message comes through strong. Definitely an IMAX presentation for the entire family.